No one is immune from the short circuit of the electrical wiring or the burnt pans on the stove. 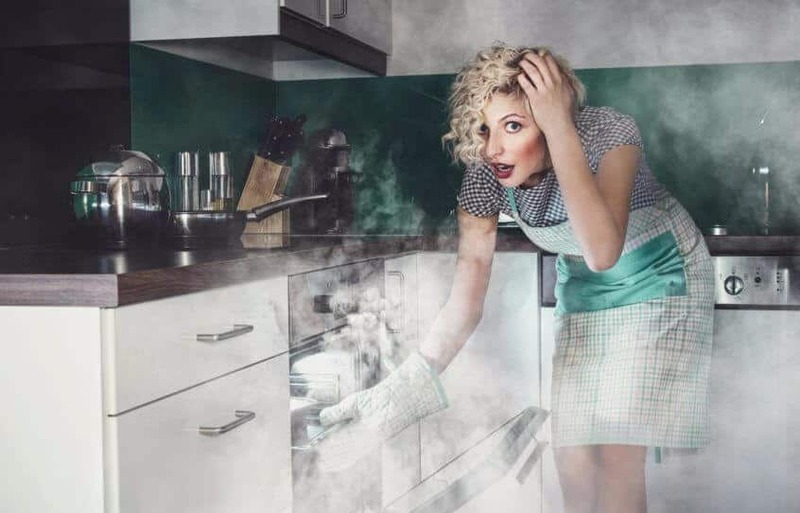 After such an event, the apartment is saturated with an unpleasant odor, so the question of how to get rid of the smell of burning in the house is very relevant. If you forgot to turn off the pan, and the kitchen is filled with smoke from the burnt food, you need to take urgent measures. Remove the smell of burning in the house will help intensive airing. Open wider the window, let the fresh air rush into the room. To enhance the draft, it is desirable to turn on the fan. Continue airing as long as possible, if weather conditions allow. This is a reliable and easy way to eliminate the smell of smoke in the house. If there is an air conditioner, on the contrary, close the windows, turn it on and leave to work in such enhanced mode for several hours. After the air in the apartment becomes fresh, you need to clean up to clean up soot from household items. Vacuum the ceiling, walls, carpets and upholstered furniture. Wipe kitchen cabinets with a damp cloth, wash the stove, window and floors. Sure to wash the curtains. If the fire was small, after these actions there will hardly be any unpleasant odor. Finally get rid of the smell of burning in the house will help fresh peel of citrus fruits. Arrange the skins of oranges on plates and place in the apartment. Instead of citrus fruits, you can use soda, wood ash, sprigs of needles or starch. This instruction is universal, but besides it there are some more effective ways how to remove the smell of burning in the house. Often after airing, the stench continues. In this case, you need to pick up a strong tool than to remove the smell of smoke from the house. Try to use natural coffee. It has a persistent aroma and has the ability to absorb various odors. Cork the windows, put a spoonful of coffee beans in the pan and fry them over low heat. Put the grains in a ceramic dish and place in the room. After a couple of hours, carefully ventilate the room. Perfectly absorbs the smell of lemon. Squeeze the juice out of the middle citrus, stir it in 2 l of water and wipe the items in the house with liquid. You can apply activated carbon. Crumble the tablets, put them in several places in the apartment and periodically change them to a new sorbent. If medicinal herbs grow near the house, cut off sprigs of mint, sage, thyme, lavender. Put them on the newspapers and leave them to dry in the room. They will provide meadow freshness. How to remove the smell of smoke from the house with air fresheners and other means of purchase? The main rule when using these substances is to apply them only after full ventilation and wet cleaning. Otherwise, the aerosol will mix with particles of burning and will make the air in the apartment even more unpleasant. Anti-tobacco spray will quickly destroy the smell; you can light a candle with a strong aroma for a while. In the store it is easy to purchase Odorgon. It is designed specifically to eliminate burning. Before use, do general cleaning, wash and wash all things. Liberally spray the product onto furniture and walls. Close each window, door, and wait a day. Air the room and, if it continues to smell unpleasant, repeat the procedure. If you prefer natural remedies, add water to the pan, put 5 droplets of fragrant essential oil into it and then liquid on the fire for 30 minutes. Aromatic oil neutralizes burning. Faulty wiring and improper use of electrical devices often lead to fire. Even if the flame is extinguished on time, you need to know how to remove the smell of burning in the house, because the damaged appliances emit a strong, unhealthy aroma. While the apartment is aired, examine the burnt things. Those who are badly affected, put it in the trash. Wash items thoroughly with soot and expose to fresh air. Connect the components and treat the smoky room with liquid. Take out a large old sheet before cleaning. Dilute in 10 l water 4 Art. l vinegar and wet fabric. Unscrew it and hang it in the apartment. Moisture quickly absorbs soot, and vinegar relieves odor. After eliminating the main consequences of fire, you need to find a way to finally get rid of the smell of smoke in the house. Type in a few pans of water, pour a spoonful of vinegar into each of them and put it on a fire, without covering with lids. Let them bake a couple of hours. The steam emanating from them will neutralize the smoke particles, and the apartment will stop smelling unpleasant. If there is a big fire, get ready for a serious long recovery work. In this case, the smell of burning in the house settles firmly, and you will need to try more than one means to get rid of it. First, discard burnt items. It is also better to refuse spoiled upholstered furniture. In extreme cases, you can carry out the restoration by changing the upholstery. Take the carpets, cushions, if they are preserved, to dry cleaning. Clean the walls of the chandelier, plinth and floor from soot. This can be done with vinegar solution. Add a little vinegar to the water, soak rags in it and gradually rub away soot and dirt. Get rid of the smell of burning will help humidifier, if it works at home in an intensive mode 3-4 hours. How to completely remove the smell in the house after a fire? You will have to make repairs. Perekleit wallpaper in the apartment, to carry out paint work. It is advisable to replace plastic windows. Ashes and stench firmly eats into the walls, plastic, and they spread a rancid scent for a long time. After the fire in the garage, only OdorGone Smokebusters helped us. No known methods did not help until they found out from friends about this wonderful tool - after the first treatment, the smell of burning almost disappeared! Once, by stupidity, I put the product in the microwave where the paper wrapper was present. After some time in the process of heating, it caught fire right in the microwave, the smoke went off and it smelled. Aired the whole evening and night - it helps best, then lit the aroma lamp. Once I put the buckwheat in the microwave for 20 minutes, the water all boiled away, the plate broke and the fire caught fire right in the closed microwave. There was a lot of smoke. Airing helped, but not much. The smell of burning was very long. It helped to clean the floors and all surfaces in the house with the addition of vinegar to the water. With such things it is better not to joke. Air better immediately. Thanks for the article, I would advise you to use the smelff agent, because it somehow helped me a lot when the saucepan on the stove burned. The smell of burning weathered hard. I somehow burned the pan on the stove, I completely forgot about it. It smelled a few days. Any folk remedies did not help. It helped only airing.